For generations we've been improving the breed so you can own the best Mini Cow imaginable. Welcome to White Mountain Miniature Cattle. We are a small family breeding stock farm nestled into the mountains of central New Hampshire. 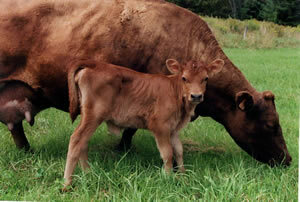 We raise Irish Jersey Cattle (also known as "Belmonts"). All our cattle are registered with the International Miniature Cattle Breeders Registry (IMCBR). Professor Gradwohl was an entrepreneur, educator, financial advisor, and miniature cattle breeder and owner. Visit our for sale page and see the latest babies and everyone else that is available. If you don't see something you like with the current list, please ask to be put on a waiting list. We're always having new additions and you wouldn't want to miss out! Give us a call and we'll tell you about our wonderful cows. You can also e-mail or send us a message with the form below. Please let us know a good time to call in the message area below. Thank you for getting in touch with us, we'll get back to you shortly!